Searching for a Dependable Heating Company in Clearwater? For all types of repairs, call the Clearwater heating company that can deliver them to you. DeZiel Heating & A/C/ can do more than just fix your heating system, our HVAC Contractor can bring your peace of mind knowing it won’t break down on you in the middle of winter. A heating system can and will break down. These systems break down mainly due to a lack of maintenance. Don’t worry if you haven’t had yours seen by a technician recently. We can make up for all those lost years. Dirty or clogged filters – Filters not only help prevent dust from entering into the unit, but they also provide better air quality when changed on a regular basis. Pilot light not functioning – The age of your heating system will all depend on whether you have a pilot light or electric. Pilot or ignition problems are very common in older units. Fan belts and bearings not maintained – A loose fan belt will cause your heating system to break down just as well as bad bearings. You need your furnace to work and that’s why we’re around. There’s no joking when it comes to your heating system. Have you ever gone to turn on your AC and it doesn’t work. If so you’re just like thousands of other homeowners. Dealing with a broken cooling system is like having a gigantic paper weight that’s completely useless. Generally repairs will cost you a lot less than a replacement would, so consider that the next time your AC goes out. The problem with cooling systems is that they work hard to push cold air out. As the exertion of force gets harder to do, the system will completely go bad. Summer time can produce some of the most intense weather patterns. Don’t sweat it out in your home take control by calling the cooling experts at DeZiel Heating & Air Conditioning. We’ll make sure that your AC is running 100%. Winter comes a lot sooner than you think. When it hits, the weather goes from mild to frozen especially in Minnesota.We’re know to have some of the coldest weather in the United States. Call us and get your heat pump prepped for those cold temps. We’re one heating company that actually cares about our customers and how they are going to manage during the winter/summer months. 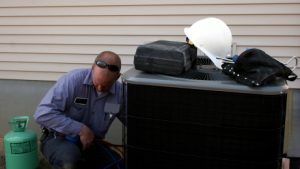 Call us today and let our helpful technicians treat your heat pump. You’re really going to appreciate it when the weather turns for the worse. If you are looking for a Clearwater Heating & Cooling Expert then please call 763-684-3965 or complete our online request form.